WASHINGTON Rep. James Clyburn (D-S.C.) told NAFCU's 2012 Congressional Caucus on Wednesday that he believed Congress would avoid hikes and cuts deadline. 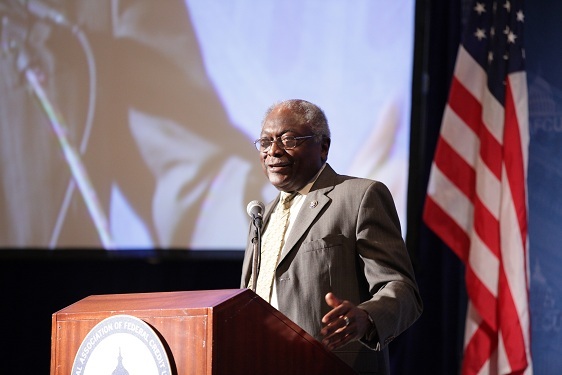 U.S. Rep. Jim Clyburn (D-S.C.) addresses NAFCU's Congressional Caucus on Wednesday. WASHINGTON — Rep. James Clyburn(D-S.C.) told credit union executives attending NAFCU’s 2012 Congressional Caucus on Wednesday that he believed that Congress would resolve lingering debt reduction and budget impasses in time to avoid a series of Jan. 1 tax increases and budget cuts dubbed sequestration and a “fiscal cliff”.